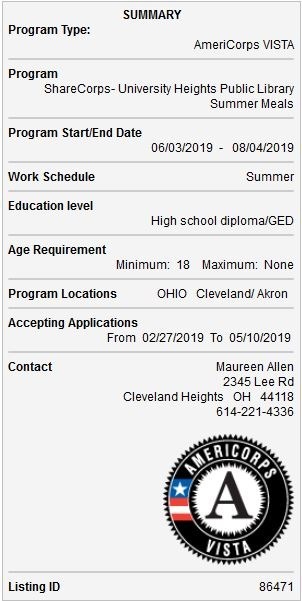 The Summer Food Service Program (SFSP) at Heights Libraries is a summer meal program for school age children supported by the Ohio Department of Education through the Greater Cleveland Food Bank. Approximately 75% of the public school students in the Cleveland Heights-University Heights school district qualify for free lunch through the school year. June through August is a challenging time of year when students have limited or no access to the school lunch program. Heights Libraries strives to fill that gap in service through the Summer Lunch Program. The VISTA Summer Associate will assist with the implementation and execution of the Summer Food Service Program (SFSP). They will assist library staff with: setup, service, and cleanup of daily meals; data and attendance tracking; engaging youth through enrichment activities; planning enrichment activities; and community outreach and promotion of our program. Help us engage more youth this summer through a rewarding term of service! Living Allowance, Choice of Education Award or End of Service Stipend, Training. Education, Hunger, Children/Youth, Community Outreach, Community and Economic Development, Health. General Skills, Teaching/Tutoring, Writing/Editing, Youth Development, Community Organization, Communications, Education. Questions? Contact Heights Libraries’ Special Projects Manager Maggie Kinney at mkinney@heightslibrary.org or 216-932-3600 ext. 1290. I am willing to help with the summer lunch program if you need me to help out. let me know if I am allowed to do that. thanks anyway if I can not. If you are interested in volunteering at the library, feel free to fill out our volunteer application at https://heightslibrary.org/how-do-i/volunteering-for-the-library/. You can write in a note on the application specifying that you are interested in Summer Lunch.